Come and surrender to the music and your body. Come dance freely without judgment or goals. We do a gentle warm up followed by over an hour of self-shaped dancing. The music is continuous, slow and fast, and from all over the world. Some verbal imagery will invite you to let go of expectations and explore your own movement. 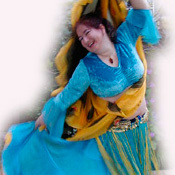 It’s a time of free and ecstatic dance, belly dancing with our sisters.